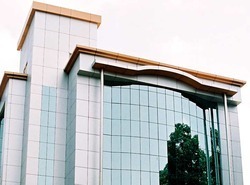 Leading Manufacturer of aluminium structural glass glazing from Ahmedabad. Aluminium Composite Panels (acp) sheets are vastly used for cladding on Builing elevation. ACP sheets are available in the price range of Rs. 80/ sq. feet to Rs.300 / sq. feet. To fabricate and install Aluminium sheets / ACP sheets costs around Rs. 180 to 450 / sq. feet. ACP sheets are weatherproof, fireproof, uv resistance sheets. Cladding of ACP sheet on wall is very cost effective for decorative look. Thousands of color shades are avalable in ACP sheets.